The classic banjo is a fretted instrument fitted with five nylon strings tuned to G C G B D. (Note: this is the normal tuning for the classic banjo) The instrument is played with the bare fingers, this method of playing is known as finger style. NOTE: The classic banjo has in the past been called finger style banjo also classical banjo, but the preferred name is now classic banjo. Classic banjo is a type and style of banjo playing, not to be confused with the playing of classical music on the banjo. Any type of music can be played on the classic banjo. More information about classic banjo societies etc. can be found on the links page. "The British BMG Federation Newsletter"
More information about classic banjo magazines etc. can be found on the links page. 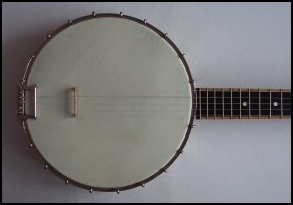 The zither banjo was developed from the open back classic banjo at the end of the 19th century, by Alfred D. Cammeyer. It was designed with a deep resonator and fitted with a mixture of steel and gut (nylon) strings to give the classic banjo a more sustained ringing tone. Today many classic banjo players, play both zither and open back classic banjos, and consider the zither banjo to be just another type of the classic banjo. For more information about the zither banjo Click here to go to a website devoted to the zither banjo, or go to the Classic Banjo Links page on this website. James Allgrove is a performer and teacher of the Classic Banjo. For more information Click here to go to the James Allgrove website. Douglas Back is a performer and teacher of the Classic Banjo. For more information Click here to go to the Douglas Back website. Chris Sands is a performer and teacher of the Classic Banjo. For more information Click here to go to the Chris Sands web page, on this website. Probably one of the youngest professional classic banjo performers in the world today is Elias Sibley, who started playing the banjo when he was ten years old. In the Millennium year he made a recording of some of the classic banjo music he performed during that year. For more information about this CD see the CD Recording pages on this website. For more information Click here to go to the Elias Sibley website. For information about other outstanding Classic Banjo performers, go to the Banjo Links page on this website. For more information about playing and tuning the classic banjo, also books and CDs etc. Click here or go to the Classic Banjo Links page on this website.